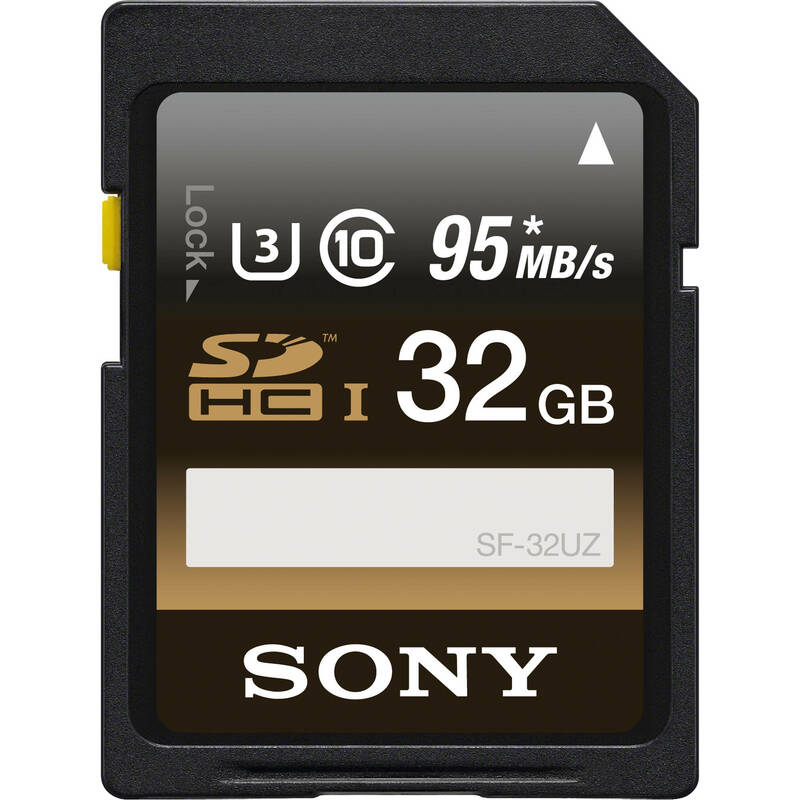 The 32GB SF-UZ Series UHS-I SDHC Memory Card from Sony features a storage capacity of 32GB and takes advantage of the UHS-I bus to support DSLR functions such as 4K and Full HD video, as well as RAW and JPEG captures. It can achieve maximum read speeds of up to 95 MB/s and maximum write speeds of up to 90 MB/s. Thanks to its U3 speed class rating, minimum write speeds are guaranteed not to drop below 30 MB/s. If your device does not support U3, this card is compatible with the U1 and Class 10 standards, each of which guarantees minimum write speeds of 10 MB/s. 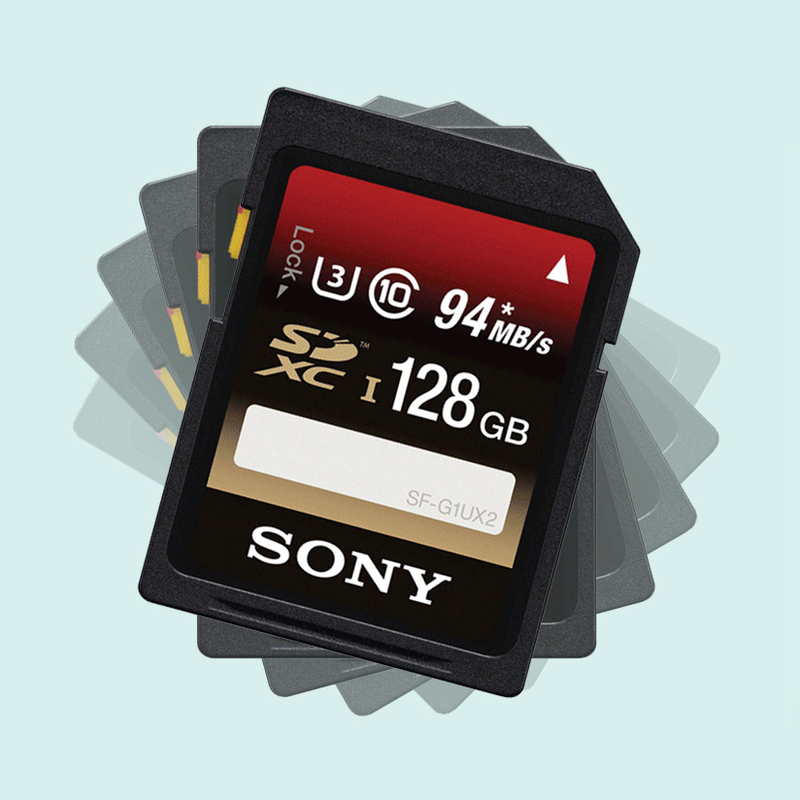 As with most Sony cards, this memory card is well-protected against water, dust, UV light, X-rays, magnets, and static, while also being able to withstand temperatures from -13 to 185°F, allowing you to take this card with you into extreme environments, such as snow and deserts. Should the card's data become compromised, you also benefit from the option to download File Rescue software for free to help recover deleted content. Furthermore, a built-in write protect switch helps to prevent accidental deletions. With a read speed of up to 95 MB/s, even large files such as 4K or Full HD video captured in XAVC S, or a bunch of high-resolution images by continuous shooting can be quickly transferred to your system. Spend less time waiting and more time doing. This card offers reliability and durability even in intense use. It is resistant to water, dust, UV light, X-rays, magnets, static, and can withstand temperatures ranging from -13 to 185°F. This card supports UHS-I interface performance. Box Dimensions (LxWxH) 2.8 x 2.4 x 0.1"
32GB SF-UZ Series UHS-I SDHC Memory Card is rated 4.4 out of 5 by 28. Rated 5 out of 5 by Anonymous from I Trust Sony. Although the card was for 4K, we haven't got the chance to try it out with a 4K camera yet. But for DSLR (Canon), it's a breeze. We shoot a lot of Weddings and corporate videos, and it's perfect for that. The size and speed of this card is great. We haven't ran into any issues so far for the past 6 months that we've had it. I'm a SanDisk Extreme Pro/Plus kinda person, but just thought I'd give this brand a try, and it works well. I haven't used it much for photos, but I do take timelapse once in a while and it's been great for that. No buffering issues or anything like that. If you can't justify paying too much for a SanDisk Extreme Pro SD card, I'd give this a try. Might pick up some more in the near future. Rated 4 out of 5 by jmarquis from No issues with the SD card at this point Although rated for 4K, I've only used it for HD video at this point. It works fine with my Panasonic XL100, so I'm pleased. Rated 5 out of 5 by James Vista from Fast and a lot of space I needed a big card for my a6000 since I didn't want to keep taking the card out and inserting another. I've taken 1080p videos with this card and plenty of burst photos. It's very fast! Rated 4 out of 5 by Mike M. from Works well- minor glitch I tried these in two cameras- one Sony and one Panasonic Lumix. The Sony was fine with it but for some reason the Lumix was giving us card error warnings and there appeared to be additional currupted files showing up in the AVCHD folder. The strange thing is all our files were there and none were missing so the corrupt files seemed to be unnecessary. Rated 5 out of 5 by WaterSpeaks from So far so good.. I photograph water primarily and images are coming through crisp and clear. No wait time for burst mode due to high write speed (and camera). 95MB/s may well be overkill, but it works. Can't attest to longevity at this point but have been pleased with Sony cards in the past. Rated 5 out of 5 by Anonymous from Great! I needed a fast SD card for my new Sony a6000 due to the high bandwidth requirements of burst photos and HD videos. This card performs as described and I would not hesitate to buy another one if my needs for storage increased. Rated 5 out of 5 by Nancy from faster card I found that if I was shooting in bursts, I sometimes had to wait for the card to catch up. With my cameras this solves my problems. 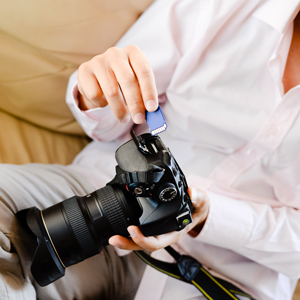 is this memory card is compatible with the Panasonic FZ1000? Yes, the Sony 32GB SDHC UHS-1 U3 Memory Card(95MB/s) is compatible for use within the Panasonic Lumix DMC-FZ1000 Digital Camera. I purchased this card for use with Sony NX3/1 with latest firmware update to record XAVC 50Mbps. My NX3 says the card is not compatible for XAVC recording? As far as I can tell it should be able to record because it is rated at 90 mbps write speed. Is this card compatible with XAVC S on the Sony a6000 with the updated Ver. 2.0 driver? Thx. No it does not in my A5100. I needed to buy the 64Gb card.